Eye On Tampa Bay: Did PSTA Waste $5 Million? Last November we reported PSTA announced their Real Time Bus app. PSTA spent over $5 MILLION of stimulus tax (debt) dollars to implement the app and their announcement stated "this may be the biggest improvement in PSTA history". ...PSTA announced recently they spent $5.1 million of federal stimulus tax dollars aka your debt dollars for an App that provides real time bus information. If you want to use this App, it costs you 99 cents to download. It took a three year project to get this App - sounds hauntingly familiar to our federal government (HHS) spending $687 Million for a website that now has to be redone! HART diligently got a similar App (One Bus Away), that was developed by University of Washington students in 2008 and refined to be used locally by USF's Center for Urban Transportation Research and Georgia Tech University, virtually free. And you can download HART's App for free. We cannot locate PSTA's Real Time Bus app on iTunes or Google Play. The Introduction to Real Time Bus Information website looks outdated. It does not appear to be a true functioning mobile app, but in fact is a website with a poor mobile user experience and a text messaging interface. PSTA's Real Time Bus App? Apparently PSTA is not satisfied with Real Time Bus. PSTA is now working to implement the One Bus Away App, that HART implemented for about $75K, and can be downloaded free from iTunes or Google Play. Did PSTA waste $5 million taxpayer dollars? You can be the judge, but we suggest you watch this 30 second video clip below from the Emerge Tampa Bay event held June 25th where HART Interim CEO Katherine Eagan states that PSTA will be adopting HART's One Bus Away app by the end of the year. PSTA CEO Brad Miller needs to focus on managing PSTA not running all over Pinellas County campaigning for a tax increase that will benefit them. Leave the campaigning to the county commissioners who are responsible for the referendum and the official private sector funded campaigns. PSTA lawyered up to legally skirt our electioneering laws. However, their tactics and actions are at the least, ethically challenged, as they use taxpayer funds and resources on an election issue to support Greenlight that directly benefits them. PSTA spent federal Transit Security Grant dollars (our tax dollars) on ads in support of Greenlight as we posted here. It now appears that PSTA has wasted millions on an ineffective, costly real time bus app and PSTA wants more of your tax dollars. Greenlight Pinellas will hand PSTA a $100 million a year tax increase into perpetuity. What else is PSTA wasting? Should taxpayers trust them with billions more of taxpayer dollars to build a train? Can't Pinellas improve their bus service at a fraction of the cost of a high cost rail boondoggle? The real issue is that PSTA is being mismanaged and they want a bailout in November. Taxpayers should not give it to them. 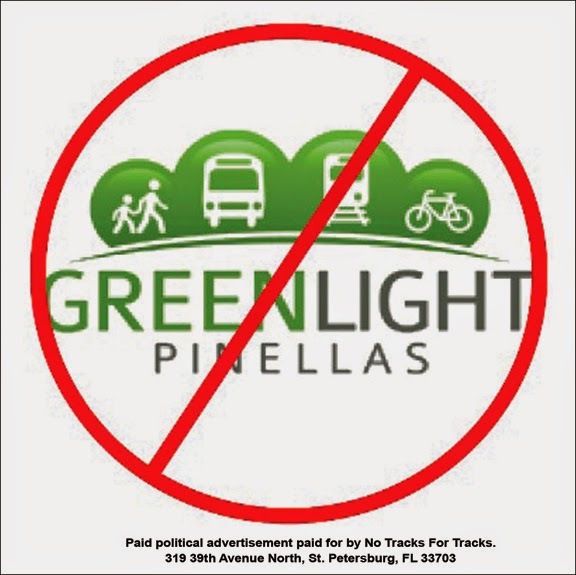 Vote NO on Greenlight Pinellas.